RUMOURS and Liverpool FC go hand-in-hand; on the internet and in the vehicles of Evertonian taxi-drivers. This summer is no different. The club’s press office sent out a notice that there would be a press conference today at Anfield at noon. Word there was going to be a press conference got out to fans and before long rumours were rife on the internet as to exactly why it had been called. The bit of the notice from the press office that didn’t get passed on was that the briefing was being held “to preview Liverpool Football Club’s pre-season tour of North America.” Not as exciting as any of the rumours but the first chance for Brendan Rodgers and a couple of his new squad to speak to the media together. It’s hardly the club’s fault if news of a press conference gets out without including details of the relatively mundane reason for it. Things have changed at Anfield as far as communication is concerned and leading that change is the manager himself. He’s as honest as he can be without hiding behind that worn-out excuse of it not being “the Liverpool Way” to answer questions that maybe should be answered. Presumably that’s his own choice, although the new director of communications, Jen Chang, is also trying to find the right balance between the public battles seen under Hicks and Gillett and the lockdown seen since they went. This being Liverpool any news can be blown out of proportion and it’s going to take time to get it right. The club will probably be afforded that time, much the same as Brendan Rodgers will be afforded the time to get his project right. There’ll be much sarcasm and many an angry retort but if supporters feel hearts are in the right place there’ll be patience too. Some news got blown out of proportion yesterday. Liverpool had a new mascot, ‘Mighty Red’, the club’s first official mascot. (That fact has been disputed by some who remember ‘Anfield Arnie’). The first reaction on hearing this was automatically negative for the vast majority of supporters who aired their views. At least the ones I saw or heard, including my own. Images of some scruffy-looking furry costume being worn by an underpaid or unpaid supporter running up and down the touchline flashed before the eyes in a way that suggested the end of the club was nigh. What next, many asked, music after goals, cheerleaders, other unimaginable horrors? Well none of them, as it happens. Even that image of the mascot running up and down the touchline wasn’t accurate because this mascot won’t be going near the touchline during matches. George Sephton is still going to be at Anfield next season too – and it’s unlikely George would be at Anfield next season if he was told he had to start playing music after goals. As for cheerleaders, well, just like mascots, the ground isn’t big enough for them. Where would they go? Anfield isn’t big enough to let everyone in who wants to see the match, let alone a large cast of a sideshow none of them want to see. The mascot isn’t one of those initiatives to “enhance the matchday experience”, it’s something created to engage with children as part of the work of the Liverpool FC foundation. In the midst of our shock at what was dancing in front of our eyes we were told it would be heading off to Alder Hey at some point. Eventually all of what had happened sunk in and we realised it was probably a good idea after all. Perhaps if we’d been warned and had some of this explained first we’d have reacted a little differently. 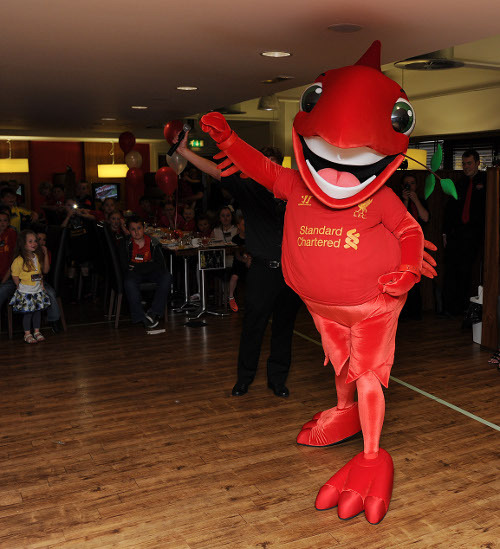 The launch of the mascot was at a party attended by 50 or so children at the Boot Room cafe at the back of the Kop. Alan Kennedy was there too, but in a couple of weeks it’s likely the kids, certainly the younger ones, will recognise ‘Mighty Red’ before they recognise ‘Barney Rubble’. As long as the mascot doesn’t replace the efforts put in by players past and present to represent the club in its work for good causes it can only be a good thing. The purple third kit wasn’t as bad as people feared it would be, even if few people would go as far as saying they like it. It’s just a shirt. Maybe the mascot is worthy of the same kind of reaction. It’s one of those things, live and let live, as long as it doesn’t sit in front of you at the match or start wearing a jester hat what harm can it do? It doesn’t look scruffy, yet, although some of the kids it was unveiled to found it a little creepy. Not all kids like cartoon characters brought to life in adult size. It seems inevitable that mini versions of the mascot will be sold in the club’s stores at some point – maybe they’ll be sold with all proceeds going towards the Liverpool FC foundation. They certainly should be. Today’s press conference is unlikely to contain any surprises of the kind that yesterday’s party saw. Maybe someone will ask if ‘Mighty Red’ is joining the squad as they head to the US to play in front of what the club will hope will be sold-out crowds. There’s more chance of getting an answer to that question than to who’s joining the squad as a new player for next season. Dunno if your comment about sold out crowds was sarcasm or not, but me and four friends are flying all the way from Texas to watch the Reds play. So I hope you weren’t kidding because there are fans all across the country. Nick – I thought tickets for the games had sold out, maybe not because it seems tickets are still on sale through lfctour.com. Not used to tickets being on sale long for Reds games! Good idea, but it looks nothing like a Liver Bird! It looks like a fish on legs! Bit tubs our Mascott and I dont trust that smirk. Hey Jim, is that you on the left of the pic, gazing sourly at Mighty Red?!! Gazing in disbelief at that stage I think Dave, but yes, it’s me! A liver bird? Looks like a red frog/demon. Great idea for club charity events and the kids at games, but really, do we need such a thing at the ground? We have managed for 120 years without a mascot, so why have we got one now? The Americans are going round the twist and so is the new boss if this was his idea. Good for the kids behind the scenes and to lead them out at reserve games or for fun at our charity events or the shop, but please not before the games.